Omega’s gumboots are made for dancing. Mendelssohn’s Second String Quintet wasn’t published until after his death the composer having qualms about the finale. The fierce energy with which the Omega Ensemble’s string quintet dispatched the last bars in the performance last night, however, may have ameliorated some of Mendelssohn’s concern. This was a vibrant performance perfectly suited to the concert’s title, Momentum. 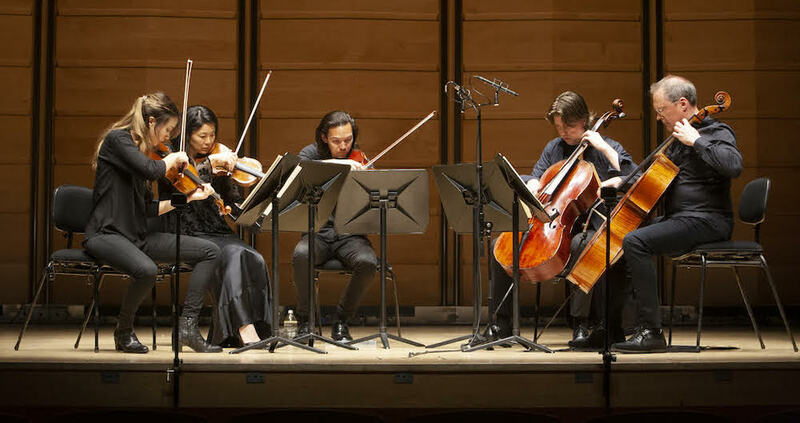 Violinist Anna Da Silva Chen led the quintet – Mendelssohn wrote for Mozart/Beethoven’s two-viola line-up – consisting of violinist Airena Nakamura, violists Amanda Verner and Neil Thompson, and cellist Howard Penny, guesting courtesy of the Australian National Academy of Music. Chen’s violin gleamed at the upper end of the spectrum, over the earthier motoring of the ensemble in the first movement. The quintet maintained momentum into the Andante scherzando, though this was a little on the heavy side, while Penny’s ascending figures propelled the Adagio e lento forward from the cello before the movement’s more lyrical textures took over. Chen led a thrumming finale with power and verve. While there was plenty of vibrancy to the sound, the ensemble’s blend wasn’t quite there, and the Quintet – and indeed the Schubert at the other end of the program – didn’t quite have the unanimity of purpose that was on display, say, in the Ravel Quartet Omega presented (with a slightly different line-up) this time last year. Nonetheless, it was a compelling performance, as was Schubert’s mammoth String Quintet in C.
Unlike Mendelssohn, the Viennese composer opted for a Boccherini-style two-cellos line-up. 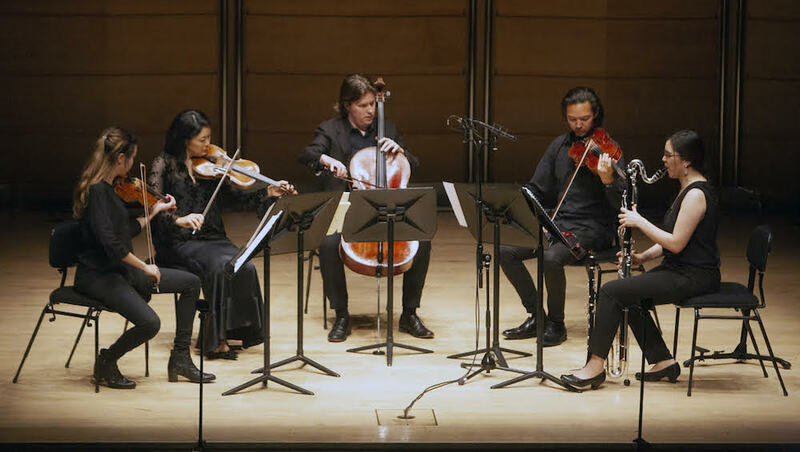 Here Chen, Nakamura, Thompson and Penny were joined by Paul Stender – who brought a beautiful, sonorous tone to the mix – in a focussed performance with an ear to the broader architecture of the work. The opening movement had a languid, conversational quality as the cellos led Schubert’s elegant melody, with violins slashing spiky accents in the more dramatic moments. Penny’s shapely pizzicato lines were a highlight in the Adagio, while his duets with Chen – the rest of the ensemble filling out the harmonies – offered contrasting colours. The gritty, folk-music roar of the strings held the audience’s attention in the third movement, while Chen shone again in the Hungarian-flavoured fiddle lines of the finale. Between the two string quintets, clarinettist Georgina Oakes joined Chen, Nakamura, Thompson and Stender for British composer David Bruce’s delightful 2008 work Gumboots for clarinet and string quartet The opening was magical – the high register of Oakes’ bass clarinet fused with Thompson’s viola to create an exquisite, glowing texture, the pair drifting apart only in their Blues-inflected ornamentation, before the sound unfurled to encompass the other musicians. While Bruce is careful to point out in his program note that this piece is not “about” the gumboot dancers of South Africa – the dance tradition, rooted in the horrendous conditions forced upon black gold miners – it certainly inspired the work, which celebrates “the rejuvenating power of dance”. The reflective opening movement, which saw clarinet crying over strings, viola sliding and the cello’s upper register luminous, found at one point a more rhythmic motion, but it wasn’t until the second movement – a suite of five short pieces – that the music really began to dance. Oakes’ gave a lively, cheerful performance, the folky first dance giving way to a quirky second, before a visceral Gershwin-slide from the clarinet opened the third. The fourth dance’s clarinet filigree, deftly negotiated by Oakes, gave way to bouncing energy and joyous trilling in the finale. A pleasure. Louise Farrenc was the first female Professor of Piano at the Paris Conservatoire, so why haven’t we heard more of her music? Omega Ensemble’s Maria Raspopova pans for rediscovered chamber music gold. In the Festival’s third year, the Omega Ensemble are the performers in residence, joining a bill that includes Ray Chen, Tamara-Anna Cislowska and Deborah Humble. The 12 musicians will go on to perform at City Recital Hall in July, competing for a chance to perform in the Finals with the Sydney Symphony Orchestra. The bow used by the actor when preparing for Master and Commander will feature in the ensemble’s next concert thanks to a donor. The orchestra turns two with an inventive, collaborative new season, featuring special guests including Anna Da Silva Chen and Umberto Clerici. Omega’s string quartet leaves a lasting impression.